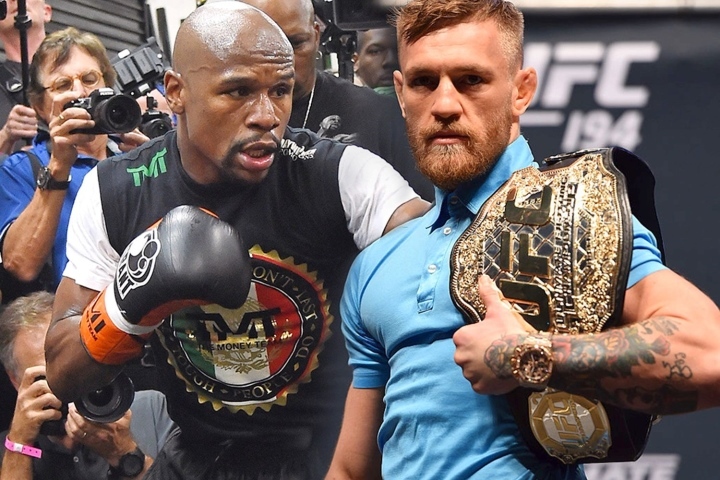 Former five division world champion Floyd Mayweather believes Conor McGregor is struggling to make the weight for their cross-combat showdown as the final countdown to the superfight cranked into overdrive on Tuesday. In comments to FightHype, Mayweather said he thought Irish mixed martial arts star McGregor looked "extremely heavy" and doubted he would make the 154-pound limit for Saturday's fight. "Conor McGregor is extremely heavy right now," Mayweather said. "I think he's 164 so he's still got 10 pounds to go." Mayweather is coming out of retirement to face McGregor in a one-off meeting between two of the best known fighters in boxing and mixed martial arts. Saturday's fight at the T-Mobile Arena is a boxing contest, a fact that will see the undefeated Mayweather start as an overwhelming favourite to claim his 50th straight victory. UFC champion McGregor, who has never boxed professionally, has vowed to knock out Mayweather inside two rounds. However the Irishman could face a painful financial penalty if he is unable to tip the scales inside the 154-pound limit. Boxers often have the option of cancelling a fight or collecting a larger share of the purse if an opponent fails to make weight. Mayweather, who is expected to earn at least $100 million from Saturday's contest, indicated he would take the money. "I get that extra money if you can't make the weight," Mayweather said. "Get those extra millions ready. UFC get those extra millions ready. "You got to get that weight down like a true champion. A true champion is disciplined and very responsible but we'll see. "If he don't make the weight, we still going to fight but there's going to be a heavy fine." Mayweather has fought at 154 pounds before but is more used to fighting at welterweight (147 pounds). McGregor however has fought at 170lbs in MMA. McGregor, 29, last week insisted he was in peak condition following a gruelling training camp that had taken him to "hell and back" and left him primed to face either a long or short fight. "There is no way in hell that I'm not ready to fight in the deepest of trenches in this contest," McGregor said. "We are ready for both scenarios. I'm ready to go to war for 12 rounds and I'm ready to put him away early on." Top Headlines Yamaguchi Falcao-Chris Pearson Lands on Facebook Watch Kash Ali Suspended For Six Months, Fined 10K For Biting Price Khan: The Fight Was 100% Turning, Crawford Was Slowing Down Regis Prograis Helping Youth As Big WBSS Fight Nears Apti Davtaev, Umar Salamov Ready For More After KO Wins Danny Garcia: I Hope I Didn't Scare Manny Pacquiao Away Commey Eyes June Return, Future Unifications - On His Terms Arum: Danny Garcia Is Not A Real Fight For Terence Crawford Terence Crawford-Amir Khan: Afterthoughts BoxingScene Championship Stats, Records: April 2019 Update Hatton: Kid Galahad To Provide Very Tough Test For Warrington McGuigan Comes To Khan's Defense in Wake of Quitter Claims Khan: I'll Always Have World Title Fights, Brook Will Be There Too Jeremiah Nakathila Wins Big, Targets Masayuki Ito Title Shot Fabio Turchi Will Now Face Sami Enbom in Florence, Italy Doheny's Dream Run Continues With Unification Against Roman Ellerbe: Arum Lost His Mind, He Talks Sh*t and Then Wants a Deal PBC Exec: Arum Desperate, Great Fights Ahead Like Crawford-Khan Khan: I Have A lot Left, This Won't Be My Last Fight, I'll Fight Again Photos: Andy Ruiz Makes PBC Debut, Batters Dimitrenko Granados: I Think The Referee Was a Little Over-Protective Tete Warns Donaire: Whoever is in My Way - I'll Take Him Out Kell Brook: I Want Terence Crawford Next, Khan Fight is Dead Photos: Shakur Stevenson Dominates Christopher Diaz Hearn Enraged: Jarrell Miller Swore To Me on Kids' Lives - F*** Off! Arum: Haymon Will Tell Spence 'Don't Listen To The White Guys' Andy Ruiz To Adam Kownacki: I Want To Fight, Let's Do This! Photos: Danny Garcia Wipes Out Adrian Granados in Seven Teofimo Lopez Feels Ready: I Want a World Title Shot Next Photos: Teofimo Lopez Cracks Edits Tatli With Body Shot Danny Garcia: When I'm at My Best - Nobody Can Beat Me! Crawford: Whenever Spence is Ready - He Can Come & Get It! Photos: Crawford Drops Khan, Strange TKO End After Low Blow Photos: Dave Allen Blasts Out Lucas Browne With Big Body Shot Photos: Chisora Fails To Impress in Decision Over Gashi Archie Sharp Feels Ready For a Showdown With Lee Selby Teddy Atlas on Crawford-Khan: It's Not Good For Boxing or ESPN Kell Brook: Amir Khan Quit, He Was Looking For a Way Out! Arum: Khan Was Looking For a Place To Fall, Could've Recovered! Crawford To Amir Khan: You Didn't Quit? Tell The Truth!